Yet, there’s another technique available to you and it happens to be my favorite cooking technique of all time, especially when I’m entertaining. That technique is called braising and it’s yielded some of the best dinners I’ve ever made, like this coq au vin and these braised short ribs. Why do I love braising so much? 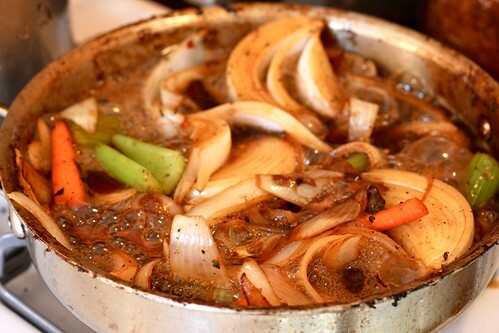 Because the steps are always the same: (1) you brown meat; (2) you add aromatics to the pan (onions, carrots, celery); (3) you add your braising liquid (wine, stock, beer, you name it); (4) you put the meat back in, cover it and stick it in the oven for hours. 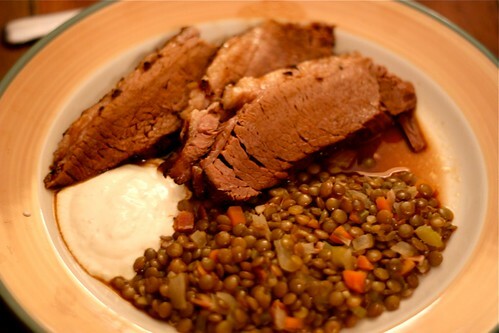 By the time your guests are sitting around the table, happily clinking their wine glasses, you have a moist, succulent protein (succulent because braising meats are generally tough at first, but all that cooking time breaks down their collagen and fat) and an enriched, deeply flavorful sauce. Cook a starch along with it (potatoes, noodles, rice) and you’re golden. That’s why I love braising. 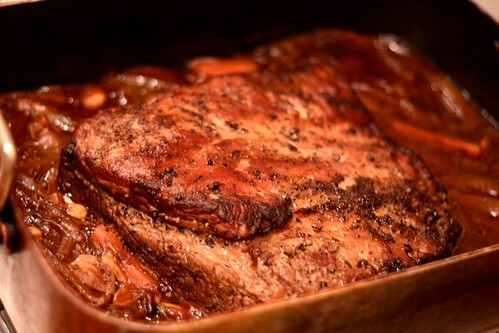 Of all the foods you can braise, the one that’s the most obvious (especially if you’re Jewish) but the one I’d never braised before is a brisket. It’s a big, tough slab of meat that becomes tenderer the more you cook it and growing up, I’d go to Hanukkah dinners at the homes of aunts named Rhoda or Hilda, and there’d be a braised brisket—usually cooked with lots of carrots and root vegetables. The recipe is quite detailed but I’m going to make it really easy for you. 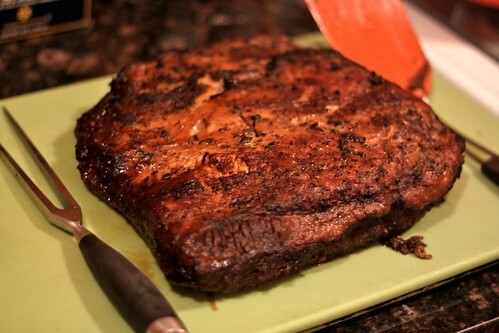 The key, when buying brisket, is to ask them to keep a 1/2-inch top layer of fat. 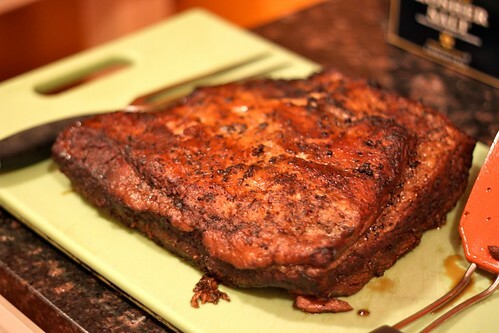 That’s what keeps the brisket from drying out, so make sure to tell your butcher. Step 3: Sear the meat. An hour before you’re ready to cook (and at least seven hours before you plan to serve it), remove the tupperware from the refrigerator and let it come up to room temperature. After an hour passes, preheat the oven to 325 F.
Folks, I’m not going to lie: this made a mess. Kristin, Craig’s sister was watching me do it as I struggled to move the brisket around (hint: use tongs AND a meat fork) and even the wall, by the end, was splattered with peppercorns and brisket fat. BUT! 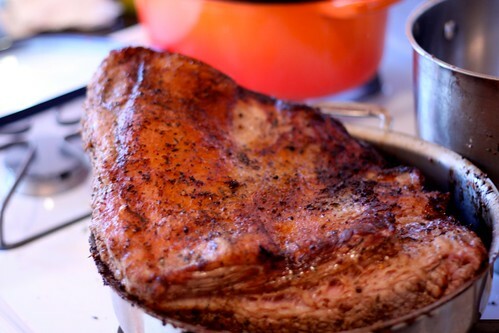 As you can see from the lead picture, searing your brisket gives it a glorious color when it’s done later. You can probably skip this step and just braise the brisket without searing, but you’ll miss a lot of flavor. Plus, even though it’s a messy nightmare, it’s also kind of fun. Sear it until it’s brown all over. 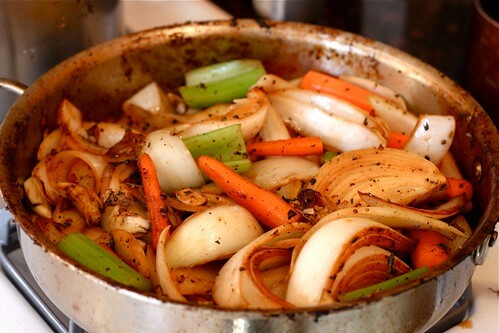 Step 4: Add your aromatics. 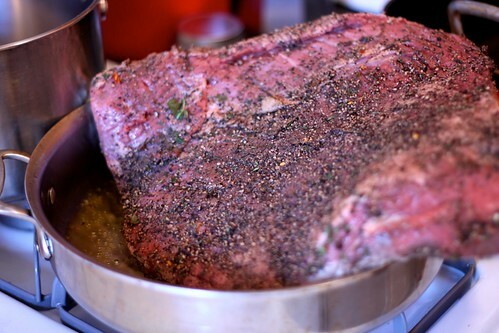 Once it’s browned all over, remove the brisket to a large roasting pan or, if it can hold it, a huge Dutch oven. If there are burnt bits in the bottom of your skillet, get rid of them with paper towels and a metal spatula: that’ll make your sauce bitter. If there’s enough fat in the pan, don’t do anything. If not, add a splash more olive oil. 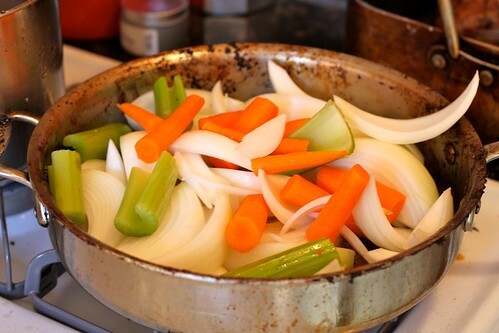 To the pan, add 2 medium onions, peeled and cut into 1-inch thick wedges (leaving the root end intact) and 3 carrots and 1 stalk celery cut into thirds. 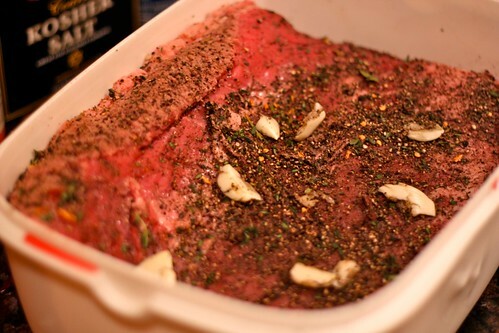 …add all the garlic and bay leaves and chiles you conserved earlier. Stir around and cook a tiny bit more. Step 5: Add your liquids. 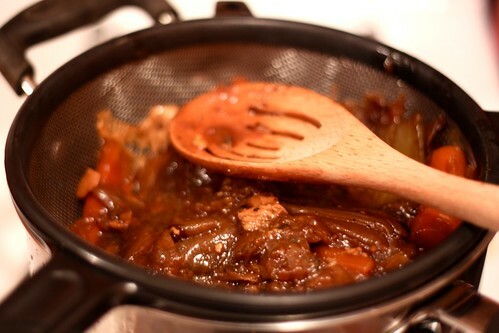 Turn off the heat and add 1/4 cup balsamic vinegar and 3 cups dark beer (such as Guiness or Samuel Smith). Step 6: Cover the pan and braise for hours and hours. Now the best part: into the oven this goes for FIVE to SIX hours. If you’re hosting a dinner party, that’s a gift unto itself. You can use this time to clean, to vacuum, to pretty yourself, to set the table, to make a playlist and to drink yourself into oblivion. 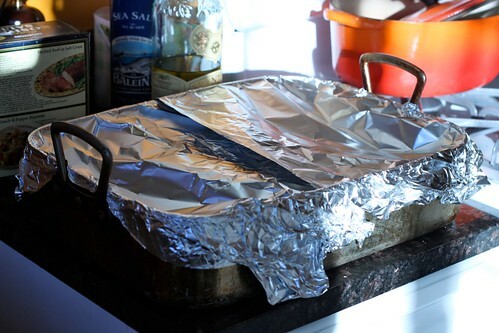 Meanwhile, turn the light on in your oven just to make sure no steam’s escaping from your foil tent. If it was escaping, you’d most likely see it. Also: this is a good time to mention that braising meat like this for hours and hours fills your apartment or house with the most glorious smell. And now, at last…. 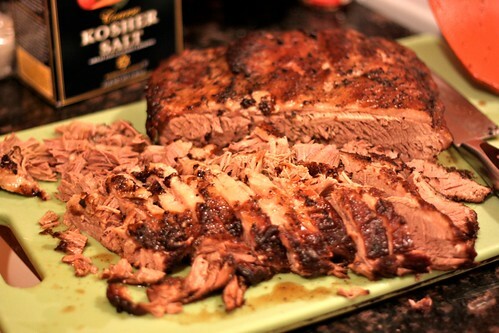 Step 7: Serve the brisket. I don’t remember exactly, but I’m pretty sure there was a round of applause. Chef Goin says you know it’s done when a fork goes in easily. You should be able to pull the meat apart, no problem. 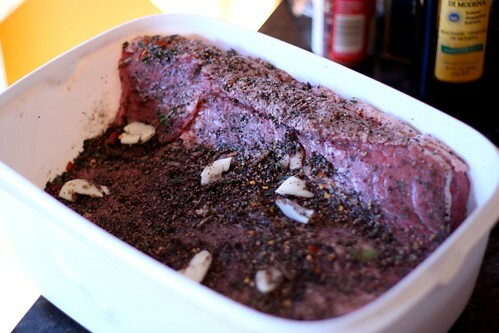 If you think it’s ready to go, remove the meat to a cutting board and let it rest for a bit…. Make sure to press down on the vegetables to extract all their goodness. Chef Goin suggests serving this with lentils and, though her recipe looked nice, I decided to use this recipe from my archives: it had bacon in it. People raved. I also made a quick horseradish cream by combining bottle horseradish, sour cream and mayonnaise. (Chef Goin’s recipe has you mix bottle horseradish with creme fraiche, but I couldn’t find creme fraiche when I did my food shopping.) Whatever you do, make sure you make some kind of horseradish sauce: it’s one of the best parts. A festive holiday dinner that, really, wasn’t that hard. 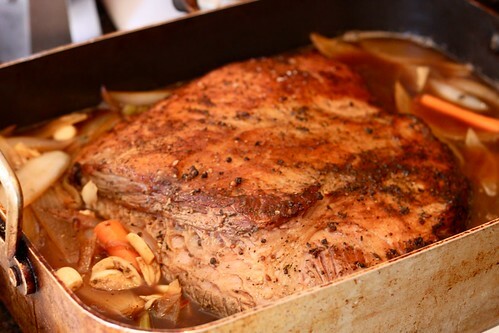 Plus, those six hours of braising are a real gift: my gift to you this holiday season.